Fed up with regular fights in Ukrainian parliament, its speaker now wants an MP code of conduct to be adopted. 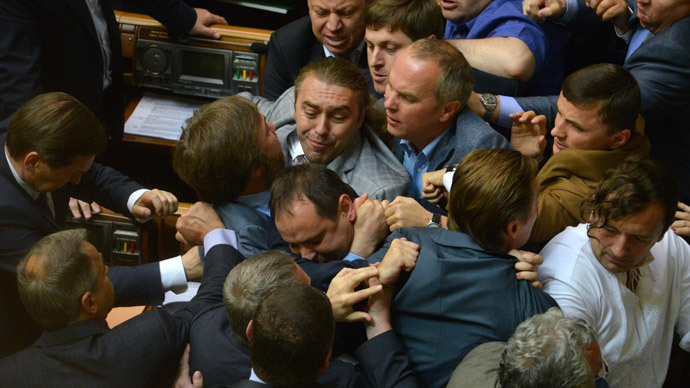 The Verkhovna Rada is notorious for its debates getting physical. Here are some of the most memorable incidents. In the latest outbreak, two MPs took their dispute outside the parliament hall - to settle their differences in a good old fashioned boxing match on Thursday. The attacker, who left his opponent with a bloody nose, later explained his actions as a battle against corruption. Putting end to fights in Rada is a big challenge, as they have long seemed to be an indispensable part of the country’s decision making. This July 2014 video shows Ukrainian parliament hall turn into a battlefield, after the speaker cut off a Party of Regions member during a speech against President Petro Poroshenko's proposed army mobilization bill. Ukrainian parliament lobby is a place to come across one politician receiving a knockout blow from another. Two deputies - non-faction Aleksandr Shevchenko and Radical Party member Oleg Lyashko, appear to be split on the crisis in eastern Ukraine. Lyashko could barely stand on his feet, after Shevchenko resorted to a set of punches to prove his point in August 2014. Oleg Lyashko became notorious as part of a vigilante team, responsible for abductions and intimidation of regional MPs over their opposition to the coup-imposed government in Kiev in 2014. And this video of an April 2014 brawl in Rada shows female MPs don’t wish to stay away from the heat of the non-verbal political dispute. One of the most picturesque fights to ever take place in the Rada was in 2010, when MPs were setting off smoke grenades and throwing eggs over the ratifying of extending the lease to Russia's Black Sea Fleet of Sevastopol's naval base. The speaker shielded himself with an umbrella to keep the session going.